J. Bair at album release party. Photo by pennlive.com. As rapper J. Bair preps for his sophomore album, vigoronline.com reflects on his debut album. On Nov. 9, the hip-hop purist celebrated his Dare to Be Different debut album — and the birthday of his late mother. He observed Dare and his mother’s life by holding a party in Harrisburg. The photo inside the Dare CD pictures Bair and his family. His mother stands in front of Bair. She can’t see him, but with her hand gently resting on his wrist, she’s aware of his presence. And Bair still feels her spirit. He said his mom gave him a wealth of advice. Her suggestion to be sociable resonates. Bair uses that tip when dealing with his peers in the local music community. “Always speak to people,” he added. When did the album drop? July 27, 2013. The response has been great. Local stores said the album has been well received. News about your album appeared in local publications and on websites, such as Harrisburg Magazine and pennlive.com. How does that feel? It was a blessing. I never take it for granted. They have been very receptive. They showed me a lot of love. What type of sound were you going for on this album? You gotta have some cohesiveness. I just wanted an organic sound. Good concept for “California Dreamin’.” How did you come up with the idea? It’s like going to paradise. As a kid, I always dreamed about going to California. In the song, I never really left [mentally speaking]. Sidenote: Rob Golden, a mentor, took him to California. Bair lived there for a couple of years. How were you able to recruit celebrity rap vets Craig G. and Sadat on “Back to Basics”? That’s one of the benefits of the internet. People have to like you. The track was a perfect fit [for Craig and Sadat]. It all came together. Does “Feelin’ Ya Pain” sample Gil-Scot Heron? Yes. Gil Scot’s sample helped to make a connection. I dig that Whitney Houston sample from your song “Is it You?” “You Give Good Love” was my favorite Whitney song. It got a feel good vibe to it. What’s the current state of hip-hop in Central Pa. now? Talent has never been an issue. There’s an abundance of talent. It’s discouraging because we haven’t had a breakthrough artist [yet]. We have [famous] athletes … Once we have a breakthrough artist, things could change. Who’s your current favorite rapper? 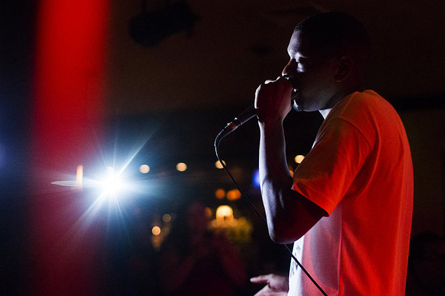 He named rappers in pairs: Jay-Z and Nas, Drake and J. Cole, and Jay Electronica and Phonte.